Pot trials were carried out on plants ofHaumaniastrum katangense, Haumaniastrum robertii andAeolanthus biformifolius. These metallophytes from Zaïre were grown in substrates containing from 0–10,000 μg/g (0–1%) copper or cobalt. The tolerance of each species was determined and for cobalt was highest inH. robertii (4000 μg/g) and for copper was highest inAeolanthus biformifolius (9000 μg/g). Discontinuities in the plant-soil curves for each element indicate an exclusion mechanism operating for all three species at lower concentrations of the element in the soil. 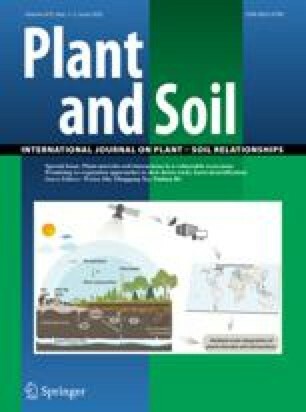 All species would grow in soils containing only traces of cobalt or copper and this indicated that uptake of heavy metals was not linked to a physiological requirement for either element. The plant-soil relationship for cobalt (P<0.001) was sufficiently good for all three species for them to be useful in biogeochemical prospecting for this element.